Well Christmas is almost here ! Hope you picked up your Holiday LE, SE an CE’s before the deadline December 31st ! Today I wanted to talk to you on how to create a folder to send your breedable in to the CSR when you have a ticket, Amaretto asks that you put your breedable in a folder with your name and ticket number. Now creating a folder is easy all you do is right click (or command click if your using a mac) in either the My Inventory folder or another folder (like the Objects folder) and click New Folder then under the folder you clicked on a New Folder will be created and ready to rename to whatever you want to name it. 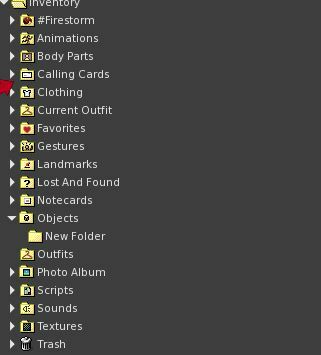 Once you are done changing the name it will fall in order with the other folders and be ready to add your inventory to it. After you have placed the horses/K-9s/barnyard birds/bundles/kennels/nests and any additional information you can add for the ticket pull our name up in search and drag the folder over to us and we will get it (even if we are offline!) and we will respond in your ticket if more information is needed or if no info is needed you will have your fixed breedable sent back in the folder described at the end of this blog. Also wanted to just mention when sending in breedables please to not pick them up in a cluster an put them in folder, This will cause problems as to having you to get LL to under cluster them for you. This is important this helps the CSR to get your breedable back to you in a timely fashion . Don’t for Amaretto Masquerade Ball today at 4:00 pm SLT !